1 Departamento de Oceanografía, Facultad de Ciencias Naturales y Oceanógraficas, Universidad de Concepción, casilla 160-C, Concepción, Chile. 2 Departamento de Óptica. 3 Departamento de Acuicultura. Centro de Investigación Científica y de Educación Superior de Ensenada. Km. 107 Carretera Tijuana -Ensenada, Código Postal 22860. Ensenada, B. C. México. 4 Departamento de Biología Marina, Universidad Católica del Norte. Casilla 117, Coquimbo, Chile. In observations by confocal or conventional fluorescence microscopy, important factors should be considered in order to obtain accurate images. One of them, such as the fluorescence bleaching from highest intensity to lowest signal of fluorescence is a common problem with several DNA fluorochromes and especially for DAPI stain. 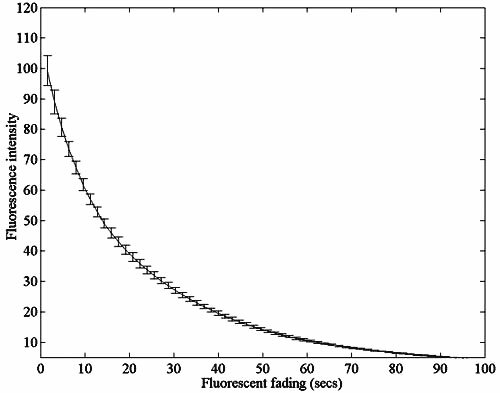 The fluorescence of DAPI fades rapidly when it is exposed to UV light, under optimal conditions of observation. Although the fading process can be retarded using a mounting medium with antifading reagents, the photochemical process underlying the fluorescence decay has not yet been fully explained. In addition, no relationship between fluorescence fading and nuclear DNA content has been tested. In order to test this relationship, we measured by means of image analysis the DAPI-fluorescence intensity in several cellular types (spermatozoa, erythrocytes and haemocytes) during their fluorescence bleaching. An algorithm specifically built in MATLAB software was used for this approach. The correlation coefficient between nuclear DNA content and DAPI-fluorescence fading was found equal to 99%. This study demonstrates the feasibility to measure nuclear DNA content by fluorescence fading quantification, as an alternative method concurrently with image analysis procedures. Key terms: Nuclear DNA content, fluorescence fading, image analysis, DAPI. From the beginning of cytological studies, the amount of nuclear DNA has been considered an indicator of the genetic characteristics of a species, and was consequently taken into account in order to explain the evolutionary process of the species. In this sense, several hypotheses have been proposed to correlate the nuclear DNA content with some traits of the organism such as cell division rate (Cavalier-Smith 1978), metabolism (Vinogradov 1995), and development (Sessions and Larson 1987). However, to determine the evolutionary role of nuclear DNA content in the natural selection process is nowadays a complex topic (Gregory 2002). In fact, in contrast to the relatively narrow range of genome sizes in prokaryotes, with only approximately a 20-fold range among all species measured to date (Kidwell 2002), eukaryotic species vary more than 200,000-fold in the size of their genomes (Gregory 2001). In this scenario, it is generally accepted that the differential amounts of non-coding DNA, such as transposable elements, satellite DNAs, and simple sequence repeats account for a major fraction of eukaryotic genome size variation (Kidwell 2002). This has been emphasized recently by the estimation that the human genome probably contains in the order of 35-75,000 genes and has a size of ~ 3X109 bp, while the genome of Drosophila melanogaster contains 13,500-19,000 genes and has a genome size ~ 1x10s bp (Hancock 2002). To date, genome sizes have been reported for ~ 3000 animals and nearly 4000 plants, as well as many fungi, protists and bacteria (Bennett and Leitch 2001; Gregory 2001). Several methods have been used to quantify genome size. Some of the earliest methods involved DNA extraction from cells. The difficulty of this method was to determine the accurate number of nuclei in each DNA extraction procedure. With time, this methodology shifted to densitometric techniques. Such methods involve a specific stain process for nuclear DNA in specific tissues on microscope slides. The Feulgen reaction has mainly been used, because this stain binds quantitatively to DNA and its color intensity is directly proportional to the genome size (Schulte 1991). Recently, densitometric methods using the Feulgen reaction combined with image analysis have demonstrated to be useful and simple methods of genome size estimation (Hardie et al. 2002). An alternative method is the quantification of fluorescence intensity in nuclei stained with specific dyes for DNA. This method has been widely applied in flow cytometry procedures and can be used to obtain high-resolution estimates of genome sizes (Al-Rubeai and Emery 1993; Haynes 1988; Martinez et al. 1990; Tiersch et al. 1989). In addition to the above procedures, in this study we propose an alternative method to estimate nuclear DNA content by fluorescence image analysis. This method is based on the relationship between the nuclear DNA content and the fluorescence fading when DNA-DAPI is exposed to specific excitation light. In order to test this relationship, the present study was organized with the followings aims: a) to establish a digital method to measure the fluorescence fading process, b) to describe fading profiles under different conditions by means of image analysis, c) to examine the relationship between fading and the nuclear DNA content of haploid and diploid cells, d) to ascertain the fluorescence fading in several genome sizes of reference species, e) to obtain a mathematical model in order to estimate genome size by DAPI-fluorescence fading. To determine the relationships between the nuclear DNA content and DNA-fluorescence fading, we used biological material of known C-value (total amount of DNA contained within its haploid chromosome set). Vertebrates: Gallus domesticus C-value=1.25 pg (Tiersch and Chandler 1989), Oreochromis mossambicus C-value=0.81 pg (Cui et al. 1991) and Oncorhynchus mykiss C-value=2.40 pg (Hardie and Hebert 2003). Invertebrates: Haliotis rufescens C-value=1.8 pg, H. fulgens C-value=1.70 pg and H. corrugata C-value = 2.0 pg (Hinigardner 1974). For DNA contents of erythrocyte nuclei, a monolayer of red blood cells was smeared on clean slides according to Hardie et al. (2002). After air drying, the preparation was fixed in absolute methanol for 20 minutes and stored in methanol at 4°C. Spermatozoa were obtained only from O. mossambicus. Mature fishes were induced to release sperm by abdominal rub down. The sperm was smeared and fixed on clean slides with modified Carnoy (methanol: acetic acid, 3: 1) at 4°C and air dried. For sample collection in haliotids (invertebrates), we used haemolymph cells and spermatozoa. Haemolymph was obtained directly by heart puncture and sperm was obtained by spawning induction of adult organisms according to Morse et al. (1977). The smear slide was obtained by a similar procedure to that for O. mossambicus sperm. The fixed cells were washed three times with phosphate buffered saline (1x PBS; 13 mM NaCl, 0.2 mM KC1, 0.8 mM Na2HP04, 0.2 mM KH2P04, pH 7.4) for 15 min and incubated with DAPI stain in the dark for 25 min at room temperature. The DAPI solution was prepared with 4,6-diamidino-2-phenylindole (DAPI) (Sigma Chemical; St. Louis, MO) in PBS at 0.5 µg/mL concentration. The fluorescent images were digitally captured with a macro programmed under QWIN software (Copyright © by Imaging Systems Ltd, Cambridge, U. K., 1997), and connected to a motorized epifluorescent microscope Leica DMRXA2, plus digital camera Leica DC300. This program sequentially captures digital images during a fluorescence fading period upon the slide. In addition, the program is able to perform an automatic capture of several microscope fields on the examined slide. Thus, it is not necessary to pre-locate the cells to measure the fluorescent cells; moreover the best focus is initially positioned. The capture conditions were: CCD exposure time of 509 milliseconds, gamma equal to 1 (linear response) and color depth of 8 bit/channel. The fluorescence conditions were: EX 340-380 nm, DM 400 nm, AB 435-485 nm, and objective lent PL Fluotar 63X/0.7. Image analysis was performed by an algorithm specifically built in MATLAB software (Copyright © 1984-2000, The MathWorks, Inc.). The figure 1 shows the flow diagram representing the steps of the algorithm to obtain the fluorescence fading values. In step 1 ,ƒ1,ƒ2,.....,ƒk 1S the stack of k images sequentially captured of size N x M pixels. Step 2 shows the fluorescence measurement in a single nucleus. The fluorescence intensity was estimated by means of a pixel mean intensity (PMI), where Q∈ƒ¡ is the image matrix in the i'th nucleus, and QE.f such as a subimage of ƒ1, ƒ2,..., ƒk. The image mean was represents the number of N x M pixels, and Ba is the background. The subtraction of Ba indicates that only the information of fluorescence from the nucleus was considered for the calculated PMI. The fluorescence intensity was indexed at 256 level of brightness. In step 3, we calculate the fluorescence fading during the bleaching time by estimation of the integral or the number of images in a fading time and Δt the time elapsed between consecutive images. In step 4, we graphically show the integral fading as the area under the curve. Thus, IF represents the integral fading by the sum of all PMI from each nucleus through the fading process. We performed four different experiments to evaluate the relationship between nuclear DNA contents and fluorescence fading under several conditions. First experiment: to describe fading profiles with different mounting media, three solutions with or without antifading reagents were tested: a) NPG, b) NPG/1x PBS (1: 1) and c) 1x PBS. The NPG solution was prepared as 5% n-propyl-gallate in a 1: 1 glycerol: 1x PBS mixture (Krenik et al. 1989). The reason for this experiment was the fact that the fading involves an oxidative process of the fluorochrome and then, this procedure could be affected by increasing the medium viscosity and antioxidant reagents. Second experiment: the contribution of each RGB channel to IF values was obtained by plotting fading profiles of each color channel vs time. Third experiment: to describe the variability of IF values, we calculated the mean and variance, and a graphical approach was used in order to find the point in the curve where the variability became stable. This point in the curve was considered as the optimal sample size. Fourth experiment: to examine the relationship between fading and nuclear DNA content in both haploid and diploid cells, we measured the IF values for spermatozoa and for red blood cells. Finally, to approach a mathematic model we calculated a linear equation between IF values and the nuclear DNA contents used as references. 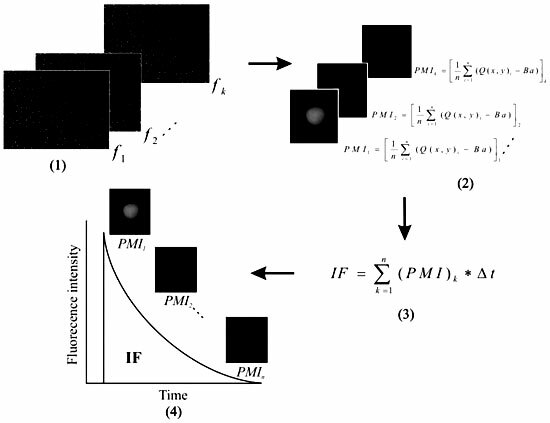 Figure 1: Flow diagram representing the steps followed to measure the fluorescence fading by image analysis. (1) Stack of digital images obtained from motorized microscopy, (2) Fluorescence measurement by PMI, (3) Integral fading, and (4) Fading profile. To visualize the fluorescence fading period, we show twelve images of DAPI-stained nuclei of Mozambique tilapia from t = 1.6 sec to t = 192 sec at different intervals (Fig. 2). The sequence of images shows the photobleaching in erythrocyte nuclei exposed to UV light. The fluorescence intensity or brightness level was visualized by comparison with a color bar. This bar shows the pixel intensity in 256 level of brightness. Graphically, our data showed that the bleaching occurs during the first seconds and is followed by a much slower rate of fall. Thus, the fluorescence intensity fell to 50% of the initial image after ~ 20 seconds of continuous illumination (Fig.3). Figure 2: fluorescence fading sequence in erythrocyte nucleus of O. mossambicus stained with DAPI. 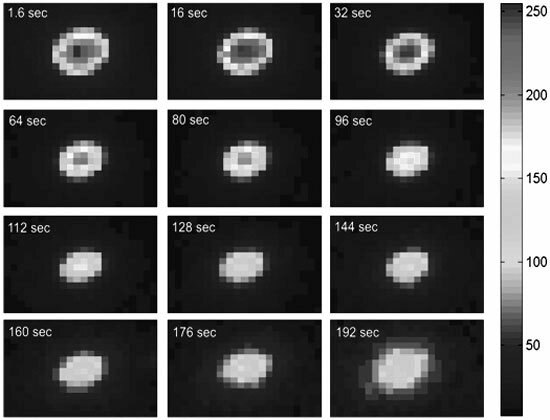 The number of images captured between the first and last image was 120 (the figure only shows twelve images). The color bar indicates fluorescence intensity. Figure 3: Profile of DAPI-fluorescent fading in spermatozoa of O. mossambicus. Each point on the curve represents the pixel mean intensity (PMI) measured every 1600 milliseconds. The bars represent two standard deviations. 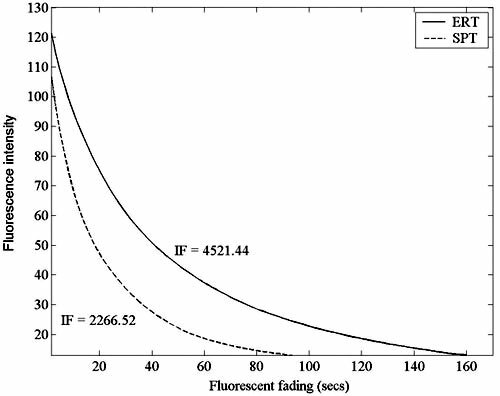 To ascertain the ability of antifading reagents to reduce the decrease of fluorescence intensity, we compared the time elapsed during spermatozoa bleaching of H. fulgens in media with or without antifading reagents under UV light exposure. 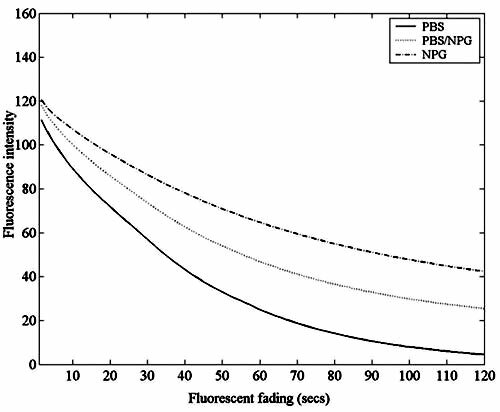 In all three solutions tested (NPG, 1x PBS/NPG and 1x PBS), the fluorescence decreased as a function of the exposition time to UV light, although the decreasing speeds and the initial fluorescence intensity were determinated by the media composition (Fig. 4). Figure 4: DAPI-fading profile in spermatozoa of H. fulgens using three mounting media: Dash-dot line, NPG; Dotted line, 1x PBS/NPG (1: 1); Solid line, 1xPBS. The DAPI-stain fluoresces mainly in the blue light interval, however, in digital images, the color is created by contribution of three color channels; red (R), green (G) and blue (B). To visualize the RGB channels intensity in a nucleus stained with DAPI, we extracted each channel from the first image of the fading period. 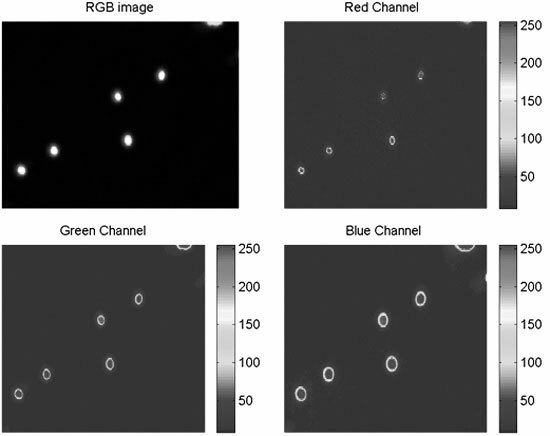 These images (R, G and B) showed that the B channel was the main contributor with the highest fluorescence information and in a lesser degree both R and G channels (Fig. 5). Graphically, to determine the contribution of each RGB channel, we tested the decomposition channels in fading profiles. 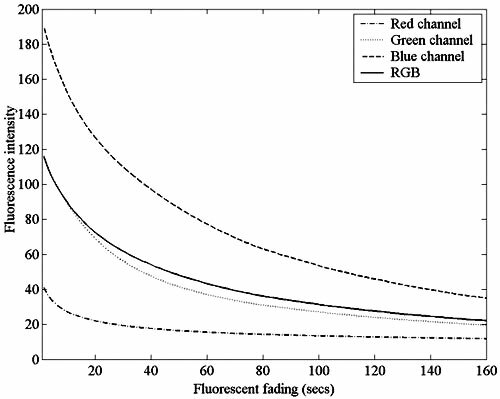 For each channel (R, G and B), fluorescence intensity was plotted against time and the RGB channel (true color) was directly obtained from digital images (Fig. 6). These analyses showed that during the fading period the B channel was the main contributor of brightness and both R and G channels contributed to a lesser degree. However, working only with the G channel increases computing time, because it is necessary to generate an additional program to extract the G channel from RGB channel. No differences between using one channel and all three channels together were detected in cell DNA estimation. Therefore, in this study, we worked with RGB channel (true color) which represented the mean of the red, green and blue channels and no additional processing is required. Figure 5: Decomposition of the RGB channels in nuclei of erythrocytes (O. mossambicus) stained with DAPI. The color bar indicates the fluorescence intensity. Figure 6: Fading profiles in RGB channels in nuclei of erythrocytes (O. mossambicus) stained with DAPI. A graphical approach was used to estimate the IF variance and to calculate the sample size in each species studied. The mean and variance were calculated by increasing the number of counted nuclei. 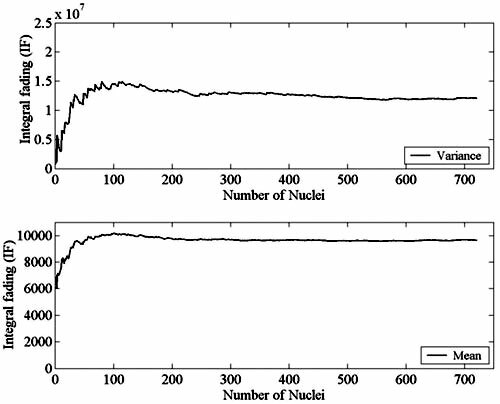 Graphically, we found that the mean and variance IF values reached a steady stage after 100 measured nuclei and then, the variance became minimal over 300 nuclei (Fig. 7). Therefore, this point was considered to be representative of the IF value. This procedure was performed in each cellular type used as reference. Figure 7: Variation of IF values in erythrocyte nuclei of O. mykiss. The variance and mean IF were calculated by increase from 2 to n nuclei measured. Fading profiles were used to estimate the area under the graph, this area represents the integral fading (IF). To ascertain our hypothesis, we plotted the integral fading of spermatozoa and erythrocytes in O. mossambicus. Although, both have different values of integral fading, the IF value in spermatozoa was 2266.52, and approximately equal to half the value in the erythrocytes, 4521.44. This relationship represented both haploid and diploid IF values for this species (Fig. 8). Similar results were obtained with haemocyte cells. In addition, we calculated a linear model between the estimated IF value for each species versus its reported nuclear DNA content (r = 0.99). The obtained linear equation was y - 3337.2 x + 596.8 (Fig. 9). 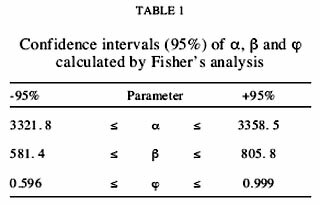 The confidence intervals at 95% were calculated by Fisher's analysis and the mathematical expectation (E) of each parameter was calculated, where E (r) = φ, E(α) = α and E(β) = β (Table 1). Figure 8: Fluorescence fading profiles in spermatozoa (SPT) and erythrocytes (ERT) of O. mossambicus. The area under the curve represents the integral fading (IF). Thus, these values represent the nuclear DNA content, haploid and diploid respectively. 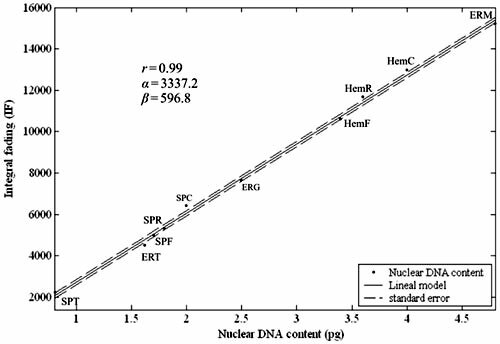 Figure 9: Linear model between IF values and nuclear DNA contents (pg) from six species (ten cellular types). SPT, spermatozoa of O. mossambicus; ERT, erythrocyte of O. mossambicus; SPF, spermatozoa of H. fulgens; SPR, spermatozoa of H. rufescens; SPC, spermatozoa of H. corrugata; ERG, erythrocyte of G. domesticus; HemF, haemocytes of H. fulgens; HemR, haemocytes of H. rufescens; HemC, haemocytes of H. corrugata; ERM, erythrocyte of O. mykiss. Recent advances in computing and image analysis technology have allowed to obtain a rapid and reliable estimation of nuclear DNA content (Hardie, Gregory and Hebert 2002). Image analysis densitometry has been accepted as an accurate means of quantifying DNA for diverse applications (Bertino et al. 1994; Gregory 2003), and has consequently been applied in plant and animal genomes (Bennett and Leitch 2001; Gregory 2001). However, this methodology involves the formulation of Schiff's reagent, whose protocol has been modified frequently and substantially since its early development. Thus, the major modifications have been the fuchsine type used, condition of hydrolysis in the Feulgen reaction and fixative solution (Schulte 1991). These conditions for the Feulgen reaction can affect the efficacy of the stain and a standard must be treated with the sample to correct any variation on the staining procedure. Alternatively, the use of flow cytometry for measurement of cellular DNA content with high degree of resolution has in recent years been considered as a reliable and standard method. At best, sperm cells or leukocytes with X or Y chromosomes can, for example, be discriminated from each other (Iversen and Laerum 1987). Moreover, flow cytometry has been applied in numerous cellular types, such as haemocytes, phytoplankton and erythrocytes (Haynes 1988; Iversen and Laerum 1987; Martinez, Beck, Allsbrook and Pantazis 1990; Rodriguez-Juiz et al. 1996; Thorgaard et al. 1982; Tiersch, Chandler, Wachtel and Elias 1989; Trask et al. 1982). Although flow cytometry is currently the most efficient and accurate method available for nuclear DNA content estimation, the cost of the equipment is a major barrier to its broad use. Furthermore, the use of cytometry procedures requires a large number of nuclei for analysis and the need to place them in suspension. In this sense, the main limitation is related to the estimation of genome size in large number of organisms and therefore in population studies. In observations by confocal or conventional fluorescence microscopy, the retardation of the loss of fluorescence, from the highest signal of fluorescence to the lowest intensity are important factors in order to obtain accurate images (Ono et al. 2001). This problem is very common in fluorochromes for nuclear DNA and especially for DAPI stain (Schwarzacher and Heslop-Harrison 2000). The fluorescence of DAPI rapidly fades when it is exposed to excitation light, and especially under optimal conditions for observation (Longin et al. 1993). Although the fading process can be retarded by using a mounting medium with antifading reagents, the photochemical process underlying the fluorescence decay has not yet been fully explained, although some theories suggest the involvement of oxygen, triplet states, and protein denaturalizations (Hirschfeld 1979; Johnson et al. 1982; Johnson and Nogueira-Araujo 1981). However, to prevent the fading process, several methods can be used to remove oxygen from the mounting medium and thus to avoid fluorochrome oxidation (Bock et al. 1985; Johnson, Davidson, McNamee, Russell, Goodwin and Holborow 1982; Takizawa and Robinson 2000). The objective is to retard the diffusion of oxygen into the DNA-fluorochrome complex and consequently to reduce the amount of oxidized fluorochrome. In this study we only used phosphate buffered saline (PBS) as mounting medium, therefore the photochemical process was not modified and the fluorochrome oxidation could only be affected by the buffer composition. Although, no relationship between the fluorescence fading and nuclear DNA content has been tested, the experiment with antifading reagents (NPG solution) support a stoichiometrical binding of DAPI to DNA because the IF value obtained with spermatozoa was equivalent to half the nuclear DNA content in blood / haemolymph cells. According to our results, we found evidence that the fading is a function of the nuclear DNA content, because the IF value calculated in spermatozoa was equivalent to half the nuclear DNA content en erythrocytes of O. mossambicus. This experiment evidences the relationship of nuclear DNA content between both haploid and diploid cells. Moreover, in all analyzed nuclei, these showed a uniform variation after UV light exposure and the IF value calculated showed a linear relationship (r = 0.99). where DNASu - unknown nuclear DNA content, IFu - unknown mean IF, with ( ) and ( ) and equal to y-intercept and slope in the linear regression, and no known C-value standard has to be run together with this problem sample. This study demonstrates the feasibility to estimate nuclear DNA content by fluorescence fading quantification. The advantage of the method proposed is that the DAPI-stain for nuclear DNA is a very simple staining method, and therefore easily standardized. Moreover, the use of image analysis allows to assay many samples in little time. In this context, the present work will allow to measure nuclear DNA content with several purposes. In fact, recently this technique has been applied to estimate the genome size in two populations of the northern Chilean scallop, Argopecten purpuratus (Gallardo-Escárate et al. 2005), and to quantify chromosomal DNA content in the red abalone Haliotis rufescens (Gallardo-Escárate et al. 2005). The next step is to ascertain how the fading process is affected by biological factors such as AT/CG ratio, chromatin compaction, etc. Likewise, it is necessary to determine, how the results are influenced by the optical design of the equipment used. This study was supported by the Mexican National Council of Science and Technology (Project 36075-B and Project 33018-B). The first author is a CONICYT-BID Ph. D. fellow. The author thanks to Karin Lohrmann for her helpful comments on a previous draft of the manuscript. Received: December 27, 2005. Accepted: May 15, 2006.